Morleys Hall passed from the Leylands to the Tyldesleys following the elopement of Edward Tyldesley and Anne Leyland around 1559. And within a ii. 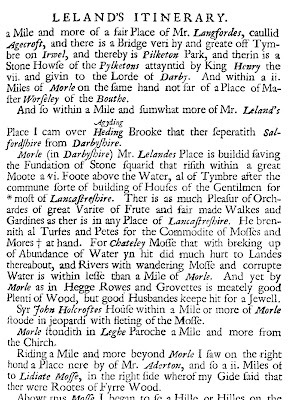 Miles of Morle on the same hand not far of a Place of Master Worseley of the Bouthe. And so within a Mile and sumwhat more of Mr. Leland's Place I cam over Agyding Heding Brooke that ther seperatith Salfordshire from Darbyshire. Morle (in Darbyshire) Mr. Lelandes Place is buildid saving the Fundation of Stone squarid that risith within a great Moote a vi. Foote above the Water, al of Tymbre after the commune sorte of building of Houses of the Gentilmen for *most of Lancastreshire. Ther is as much Pleasur of Orchardes of great Varite of Frute and fair made Walkes and Gardines as ther is in any Place of Lancastreshire. He brennith al Turfes and Petes for the Commodite of Mosses and Mores at hand. 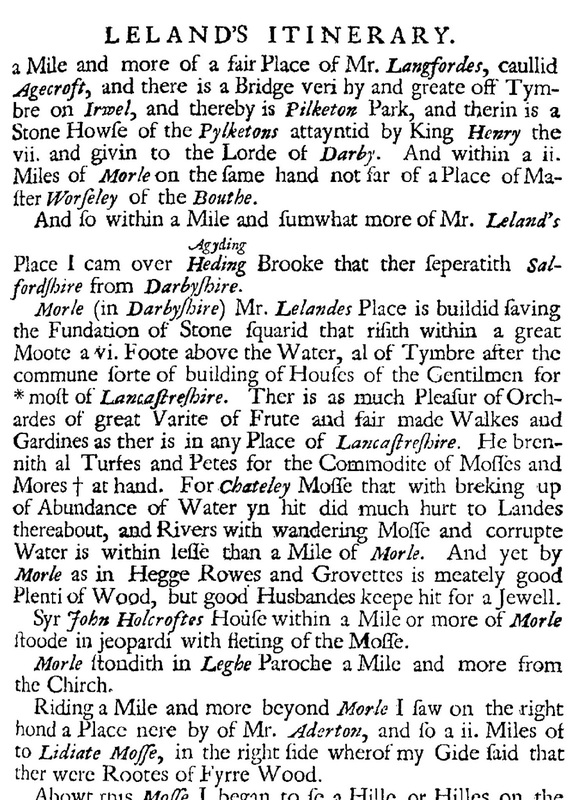 For Chateley Moss that with breking up of Abundance of Water yn hit did much hurt to Landes thereabout, and Rivers with wandering Mosse and corrupte Water is within lesse than a Mile of Morle. And yet by Morle as in Hegge Rowes and Grovettes is meately good Plenti of Wood, but good Husbandes keepe hit for a Jewell. Syr John Holcroftes House within a Mile or more of Morle stoode in jeopardi with fleting of the Mosse. Morle stondith in Leghe Paroche a Mile and more from the Chirch. Riding a Mile and more beyond Morle I saw on the right hond a Place nere by of Mr. Aderton, and so a ii. Miles of to Lidiate Mosse, in the right side wherof my Gide said that ther were Rootes of Fyrre Wood. 1. "Dict. Nat Biog." "C. W.T.," pp. 306, 353. 44 Discourse," p. 92. Myerscough Lodge lies just aside from the main road from Preston to Garstang, and about half way between the two. Until comparatively recently some parts of the old house remained, but in 1887 the Lodge was entirely re-built. Clarendon's estimate of Tyldesley is a very high one ("Hist. Rebell.," ed. Macray, Vol. 5, p. 186; bk. 13, par. 70). It appears that Broxap has confused the generations here. Sir Thomas Tyldesley married Frances Standish, who was the daughter of Ralph Standish and Bridget Molyneux. Bridget was the daughter of Sir Richard Molyneux of Sefton and Frances Gerard and was indeed the sister of Richard, the first Viscount Molyneux.Lady Frances Tyldesley was therefore named after her grandmother, and as can be seen from the Tyldesley Pedigree, she in turn gave her mother's name Bridget to one of her daughters. 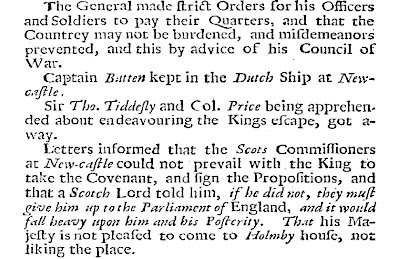 The General made strict Orders for his Officers and Soldiers to pay their Quarters, and that the Countrey may not be burdened, and misdemeanors prevented, and this by advice of his Council of War. 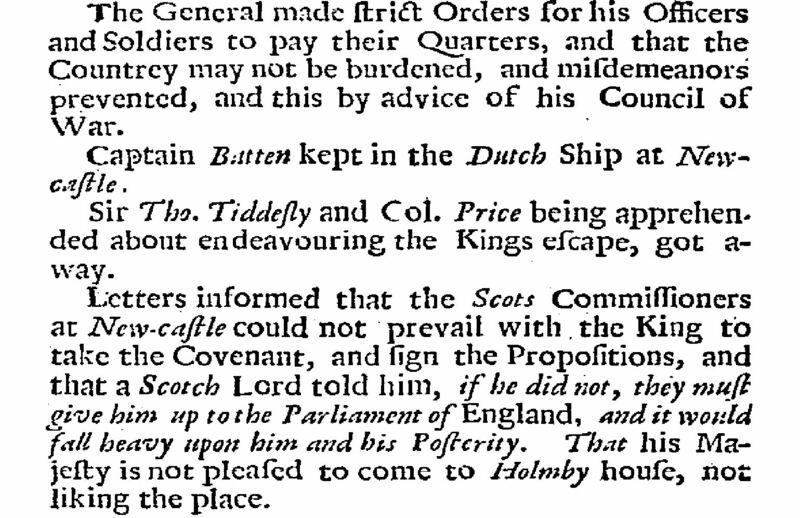 Captain Batten kept in the Dutch Ship at Newcastle. Sir Tho. Tiddesly and Col. Price being apprehended about endeavouring the Kings escape, got away. 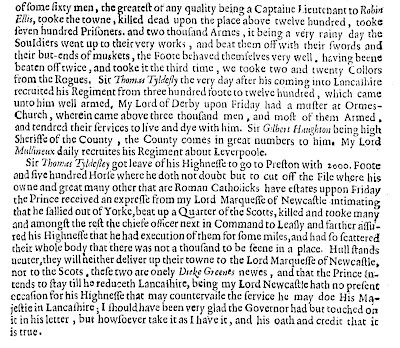 Letters informed that the Scots Commissioners at New-castle could not prevail with the King to take the Covenant, and sign the Propositions, and that a Scotch Lord told him, if he did not, they must give him up to the Parliament of England, and it would fall heavy upon him and his Posterity. That his Ma|jesty is not pleased to come to Holmby house, not liking the place. Letters, That at the routing of the Earl of Derby, were taken prisoners 5 Collonels, the Adjutant General 4 Lieutenant Collonels, 1. 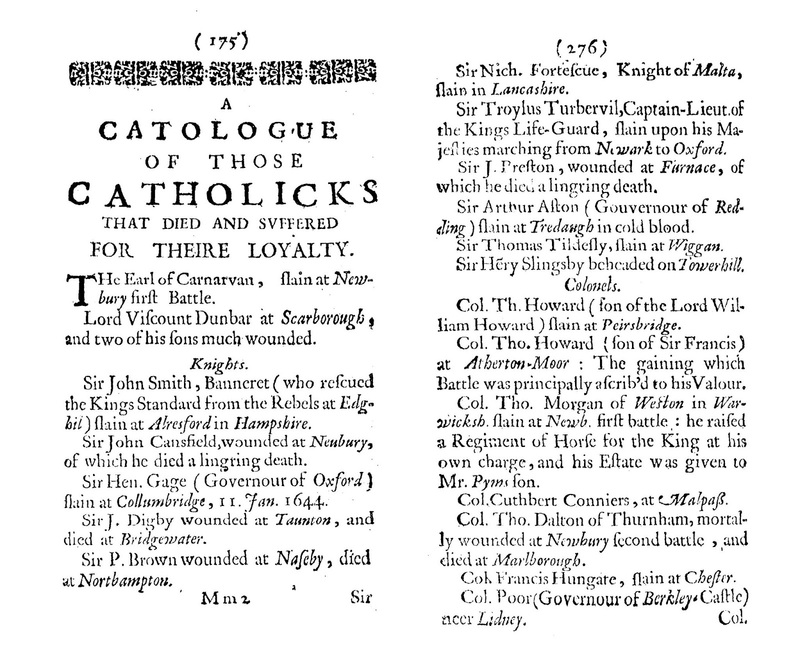 Major, 4 Captains, 2 Lieutenants, and slain and dead since they were taken, the Lord Widdrington, Major-General Sr. Thomas Tiddesly, 1 Collonel, 2 Majors, and divers others of quali|ty. All their Baggage, Sumpters, Arms, and Ammunition taken, and the Earl of Derbyes 3 Cloaks with Starrs, his George and Garter with other Robes. 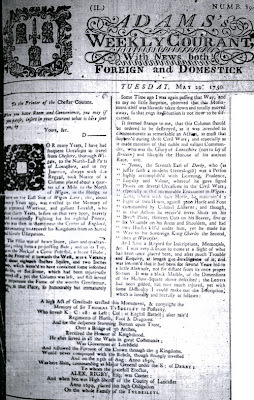 Letters, That the Earl of Derby was tryed at a Court-Marshal at Chester, at which were 20 Officers, Captains, and above that Degree, five Collonels, Major General Mitton, and Collonel Mackworth the President. That the Earl confessed the Plot for a General Rising of the Presbyterians in Lancashire, to joyn with the King; but it was disappointed by the apprehending of Mr. Birkenhead. That Sir Tho. Tiddesly, Major Ashurst, and Major General Massey, were principal Actors in that Conspiracy. He confessed the matters of Treason charged against him, and submitted to the mercy of Parliament. 1. 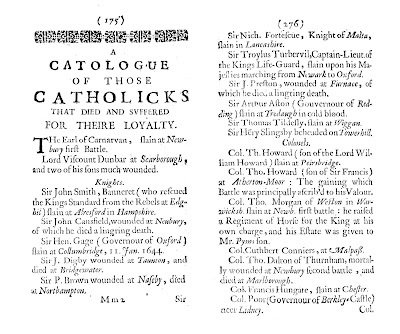 Memorials of the English affairs, or, An historical account of what passed from the beginning of the reign of King Charles the First, to King Charles the Second his happy restauration containing the publick transactions, civil and military : together with the private consultations and secrets of the cabinet. As has been noted in a previous post, in 1646 Sir Thomas Tyldesley held the close of Lichfield Cathedral for the King. 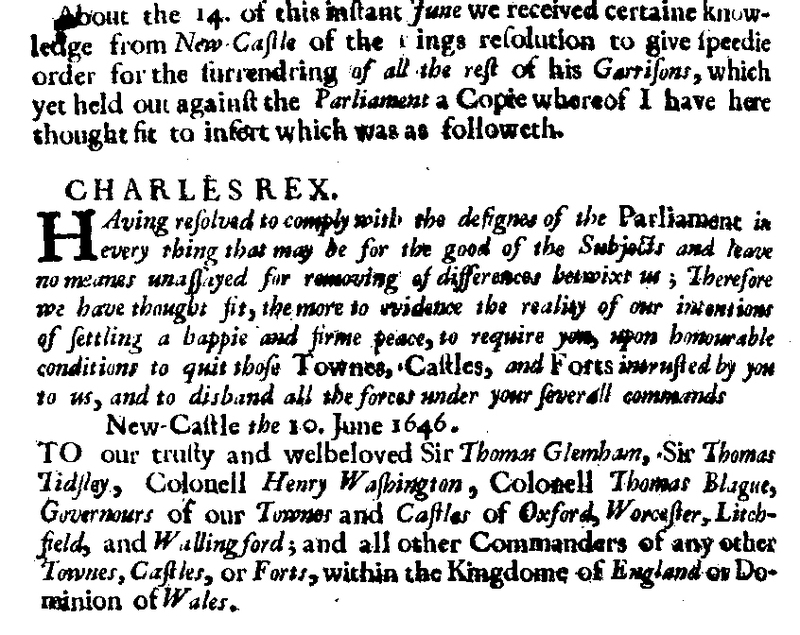 About the 14. of this instant June we received certaine knowledge from New Castle of the Kings resolution to give speedie order for the surrendring of all the rest of his Garrisons, which yet held out against the Parliament a Copie whereof I have here thought fit to insert which was as followeth. HAving resolved to comply with the designes of the Parliament in every thing that may be for the good of the Subjects and leave no meanes unassayed for removing of differences betwixt us; Therefore we have thought fit, the more to evidence the reality of our intentions of settling a happie and firme peace, to require you, upon honourable conditions to quit those Townes, Castles, and Forts intrusted by you to us, and to disband all the forces under your severall commands. New-Castle the 10. June 1646. 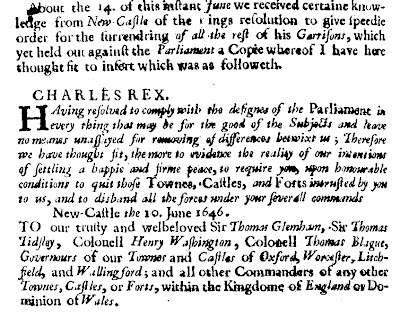 TO our trusty and welbeloved Sir Thomas Glemham, Sir Thomas Tidsley, Colonell Henry Washington, Colonell Thomas Blague, Governours of our Townes and Castles of Oxford, Worcester, Litchfield, and Wallingford; and all other Commanders of any other Townes, Castles, or Forts, within the Kingdome of England or Dominion of Wales. The Tyldesley Monument marks the place where Sir Thomas Tyldesley 1612-1651 fell during the Battle of Wigan Lane on 25 August 1651. It was erected in 1679 by Alexander Rigby, who had served as Cornet under Tyldesley. To the Printer of the Chester Courant. For many Years, I have had frequent Occasions to travel from Cheshire, thorough Wigan, to the North-East Parts of Lancashire, and in my Journies, always with due Regard, took Notice of a Column placed about a quarter of a Mile to the North of Wigan, in the Hedge or Fence on the East Side of Wigan Lane; this, about seventy Years ago, was erected to the Memory of an approved Warrior, and gallant Loyalist, who about thirty Years before on that very Spot, bravely died courageously Fighting for his rightful Prince, who was then in Arms near the Center of England, endeavouring to recover his Kingdoms from an horrid and bloody Usurpation. The Pillar was of hewn Stone, plain and quadrangular, rising from a projecting Base; and on its Top upon the Neck of a Conic Pedestal, a Stone Globe, on the Front of it towards the West, was a Vacancy of about eighteen Inches Square, and two Inches deep, which seem'd to have contained some inscribed Marble, or flat Stone, which had been injuriously sheered off ; yet the Column was left, and still served to perpetuate the Fame of the worthy Gentleman, who, in that Place, so honourably but immaturely fell. Some Time ago I was again passing that Way, and to my no little Surprize, observed that this Monument itself was likewise taken down and totally moved away, so that even its Situation is not now to be discerned. It seemed strange to me, that this Column should be ordered to be destroyed, as it was intended to commemorate as remarkable an Action, as most that happen'd during those Civil Wars; and especially as it made mention of that noble and valiant Commander, who was the Glory of Lancashire (not to say of Britain) and likewise the Honour of his ancient Race, viz. "James, the Seventh Earl of Derby, who (as justly saith a modern Genealogist) was a Person highly accomplish'd with Learning, Prudence, Loyalty and Valour, whereof he gave signal Proofs on several Occasions in the Civil Wars ; especially in that memorable Encounter in Wigan-Lane, where with 600 Horse, he maintain'd a Fight of two Hours, against 3000 Horse and Foot commanded by Colonel Lilburne; and though, in that Action, he receiv'd seven Shots on his Breast Plate, thirteen Cuts on his Beaver, five or six Wounds on his Arms and Shoulders, and had two Horses kill'd under him, yet he made his Way to his Sovereign King Charles the Second, then at Worcester." Memory of SIR THOMAS TYLDESLEY to Posterity. Regiments of Horse, Foot & Dragoons. And followed the Fortune of the Crown through the 3 Kingdoms. It will be noted that the year of the Battle of Wigan Lane is inaccurately given as 1650 rather than 1651. It is not known whether this was an error in the inscription or in the transcription. However when the monument was re-erected the error was repeated on the brass plate which replaced the marble plaque. It has long been thought that the Tildesleys of Staffordshire are descended from the Tyldesleys of Lancashire and a DNA project is now under way in an attempt to prove this connection conclusively. If you are a male line Tildesley and would like to take part all that is required is a cheek swab and payment of the relevant fee direct to Family Tree DNA. For these purposes the Y-DNA37 test should be regarded as a minimum standard. A good deal of useful information about the Staffordshire Tildesleys is available at ShareHistory. There is evidence today that Tyldesleys were in Staffordshire in the fourteenth century, for there is mention of Thomas Tyldesley in 1379; he was one of the retinue of William Windsor. A few years later Adam Tyldesley was described as esquire and Raulyn Tyldesley was an archer in the service of the earl of Stafford. The many places where these Tyldesleys in Staffordshire held land and are traceable include Aspley, Adbaston, Mucklestone, Stafford, Madeley, Eccleshall, Horslee, Aquilott, Meire, Forton, Sutton, Norby and High Offley. 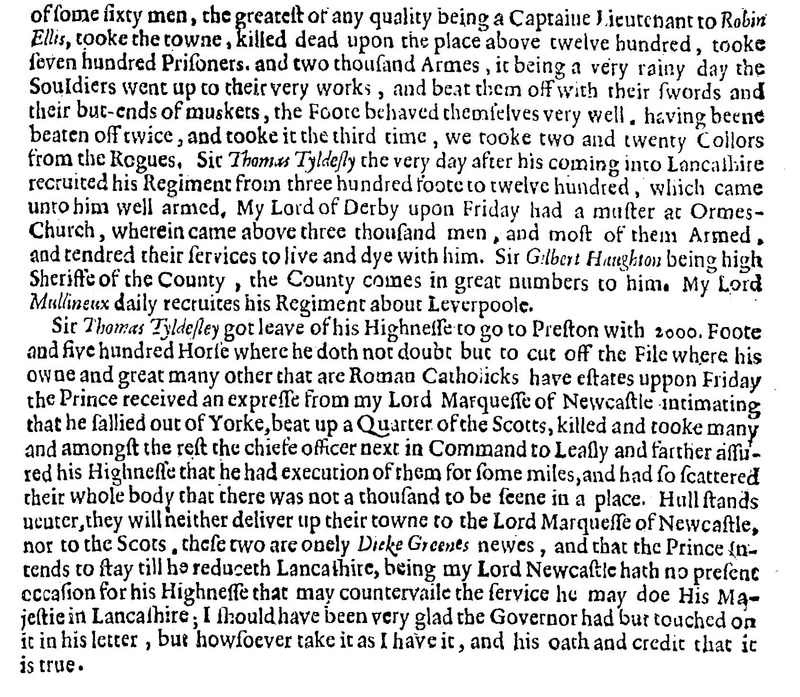 One John Tyldesley was parson of Norbury; his will was proved at Lichfield January 17, 1556. These Staffordshire Tyldesleys were Protestant, with the sole exception of the Eccleshall branch, which was Catholic and recusant about the period 1680. The Eccleshall Tyldesleys are well documented and their estates were connected with the Lancashire Tyldesleys. Thurstan Tyldesley of the house of Wardley in 1571 brought a complaint of perjury, the properties in issue were in Bolton, Middleton and Lichfield. One member of this Eccleshall branch entered the church; he was Richard Tyldesley. He was at Balliol College January 20, 1589 and later migrated to St. John's. He became M.A. June 26, 1607 and B.D. November 22, 1613 and doctor of divinity July 7, 1617. He was son of Thomas Tyldesley of Eccleshall and was instituted rector of Cuxton in 1614 and later in 1648 was expelled by the parliamentary visitors because of his Royalist sympathies. 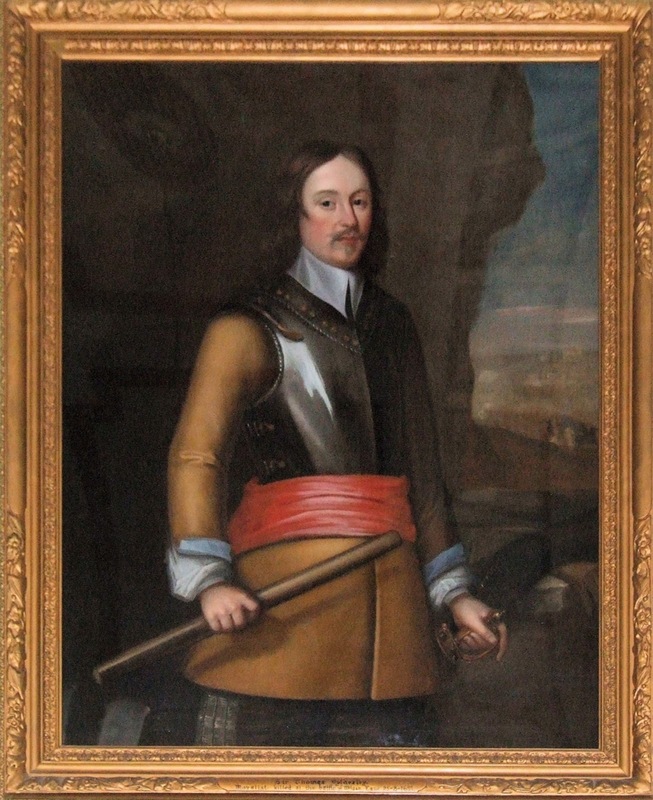 Edmund was father of Richard, who entered St. John's Oxford July 2, 1675, when it is said that he went to Merchant Taylors school and that his father lived at Northmoor, Oxford. He became curate of St. Sepulchre London in 1672, married Anne Wotton daughter of Thomas, surgeon. In 1711 he was vicar of Heston, Middlesex and died in 1712. His son Thomas entered the same college at Oxford June 28, 1710, then aged 16 and became B.C.L. in 1718. Delinquents names, whose Estates are appointed to be sold by this Act. Whereas the Estates of sir John Stowel late of Cudderstone in the County of Somerset Knight of the Bath, George Duke of Buckingham, John Earl of Bristol, George Lord Digby, William Earl of Newcastle, sir William Widdrington late of Widdrington Castle in the County of Northumberland Knight, sir Philip Musgrave of Cadwel in the County of Cumberland Baronet, sir Marmaduke Langdale late of North Dalton in the County of York Knight, sir Richard Greenvile late of Stowe in the County of Cornwal Knight, sir Francis Doddington late of Barrow in the County of Somerset Knight, sir John Culpepper late of Hollingborn in the County of Kent Knight, sir John Byron late of Newsted-Abby in the County of Notingham Knight, Edward Earl of Worcester, sir John Winter late of Lidney in the County of Gloucester Knight, Matthew Boynton late of Scarborough in the County of York Esq; sir Lewis Dives late of Bromham in the County of Bedford Knight, Thomas Levison late of Wolverhampton in the County of Stafford Esq; James Earl of Derby, John Marquess of Winchester, sir Ralph Hopton late of Wittham in the County of Somerset Knight of the Bath, sir George Ratcliff late of Colton in the County of the City of York Knight, Francis Lord Cottington, sir Edward Harbert late of Parsons-Green in the Parish of Fulham in the County of Middlesex Knight, Edward Hide late of Purton in the County of Wilts Esq, otherwise called sir Edward Hide, Richard Lane late of Kingsthorp in the County of Northampton Esq, deceased, otherwise called sir Richard Lane, Robert Long late of the City of Westminster Esq; Thomas Tilsley late of Myerscow in the County of Lancaster Esq; James Earl of Castlehaven, Philip Cartaret Esq; Son and Heir of sir Philip Cartaret Knight deceased, John Bodvile late of in the County of Esq; Peter Pudsey of St. Huton in the County of York Gent. James Bunch late Alderman of the City of London, sir Edward Nicholas late of the City of Westminster Knight, Marmaduke Roydon, late of the City of London Merchant deceased, sometimes called sir Marmaduke Roydon, John Stowel and Edward Stowel, Esqs, sons of the said sir John Stowel, Marmaduke Langdale Esq; son of the said sir Marmaduke Langdale, Thomas Earl of Cleveland, Thomas Lord Wentworth eldest son of the said Earl of Cleveland, Charles Townley late of Nockton in the County of Lincoln Esq; sir Piercy Harbert son of the Lord Powys, George Benion late of Mussel-Hill in the County of Middlesex Esq; otherwise called sir George Benion, sir Henry Slingsby of Redhouse in the County of York Baronet, William Kains of Roddipole in the County of Dorset Esq; sir Francis Howard late of Naward in the County of Cumberland Knight, Thomas Haggerston late of Haggerston in the County of Northumberland Esq; otherwise called sir Tho. Haggerston, Andrew Coggan late of Greenwich in the County of Kent Merchant, commonly called sir Andrew Coggan, John Robinson late of Gwersey in the County of Denbigh Gent. sir Richard Tempest late of Stella in the County of Durham Baronet, sir Thomas Riddle late of Newcastle upon Tyne Knight, sir John Marlow of Newcastle upon Tyne Knight, Edward Grey late of Chillingham in the County of Northumberland Esq; David Jenkin senior of Cowbridge in the County of Glamorgan Esq; Henry Lord Wilmot, Philip Earl of Chesterfield, John Denham late of Egham in the County of Surrey Esq; son and Heir of sir John Denham Knight deceased, late one of the Barons of the Court of Exchequer, sir Robert Hatton late of Bennyfield-Lawn in the County of Northampton Knight, sir Thomas Riddle the yonger, late of the Town and County of Newcastle upon Tyne Knight, sir John Somerset late of Ragland in the County of Monmouth Knight, Roger Bodenham of Rotheras in the County of Hereford Esq; sir Henry Beddinfield of in the county of Norfolk Knight, Thomas Beckwith of Beverley in the county of York Gent. Henry Percy Esq; Christopher Lewkenor late of the Middle Temple Esq; Rowland Ayre of Hassop in the county of Derby Esq; John Gifford of Wolverhampton in the county of Stafford Esq; James late Earl of Cambridge, commonly called Duke Hamilton, William Hamilton brother of James late Earl of Cambridge, John Earl of Lodderdale in Scotland, sir Arthur Aston late of the city of Oxford in the county of Oxford Knight, and Cutbert Morley late of Seymour in the county of York Esq; have been and are hereby declared and adjudged to be justly forfeited by them, for their several Treasons against the Parliament and people of England.